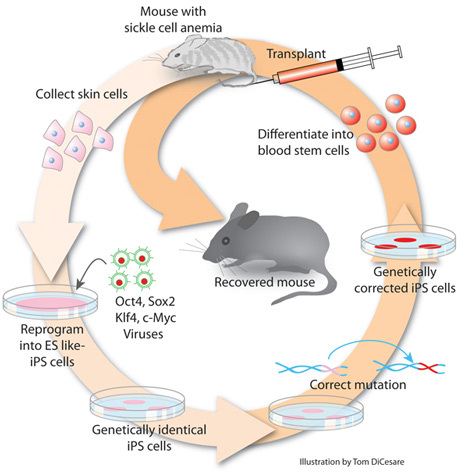 iPS cells could be used as a therapy for many genetic disorders by following three steps-Rewind,Reprogram and Replace. The scientists are excited about a type of cells called Induced Pluripotent Stem Cells or iPS cells that can give rise to any part of the body from any type of cells. iPS cells are the adult or somatic cells that are reprogramed to enter into a Embryonic Stem Cells-like state by the integration of up to four DNA-transcription factors. The groundbreaking works were first carried out in 2007 by two groups headed by James Thompson at the University of Wisconsin-Madison and Shinya Yamanaka at Kyoto University in Japan who described methods to reprogram adult human cells to a pluripotent state. In December of 2007, George Daley, of Harvard Medical School in Boston, Massachusetts, and his colleagues also demonstrated iPS cells could be generated from a variety of adult cells. According to Thomas Zwaka from the Baylor College of Medicine, “the initial idea was to generate iPS cells from any somatic cells“. This is very important because the other method of generating Pluripotent stem cells was to extract it from the early embryo and this created many political, ethical issues. Now the scientists can convert any cell in the body to a pluripotent cell. The other motive was to generate the pluripotent cells that matches the patient genetically. There were problems regarding mismatch of patient’s genetic identity and the cells obtained from embryonic stem cells. The ability to induce pluripotency allows the scientists to engineer cells that are genetically identical to those cells in the patient’s body. The three steps mentioned above also present the scientists with many technical difficulties. The first step, converting the somatic cell in to a pluripotent stem cell is a much explored area. It is now considered that at lest 4 genes are required to push the cell into a pluripotent state. It is here the work of Yamanaka becomes important. His group published the first of these results in 2006. But actually he did not use the reprogramming factor per se, but some factors that can activate a cascade of downstream of signaling events that ultimately activates a reprogramming factor. The reprogramming factors are mainly transcriptional factors that are otherwise remain silent in the adult cells but are crucial for induction of pluripotency. These factors when active will bind to and transcribe their target genes, most of which are inactive i an adult cell. Some of the very important transcriptional factors that are essential for induction of pluripotency includes Oct 3/4 and the Sox family.The Klf family and myc family of transcriptional factors are shown to increase the induction when present. The next step is gene targeting or correcting the defective gene by replacing it with the normal gene. This step should be precise that no change is made elsewhere in the genome or otherwise there will be mutations. The current method uses some vectors that are made to harbor the desired genes and then these vectors are used to transfect the cells. The vectors used can be lentiviral or retroviral which have a high transfection efficiency. But, these vectors have the ability to integrate in to genome and can cause cancers if they happen to integrate near,say a gene involved in cell cycle regulation or control of apoptosis. Adeno Associated Viruses or AAVs that integrate in to genome much lesser than the retroviruses are used more frequently nowadays. So everything is set and now you can use this as a therapy, isn’t it? No,wait, the researchers say that there are no intentions to clinically test this that soon because there are more things yet to be sure of. Another factor that should be considered is what happens if something go wrong with the cells and they start to grow uncontrollably. How do we remove them? Scientists says that no method will be of 100 percent help if this happens and the best thing is to prevent such an incidence than waiting to cure it. Prevention is better than cure! The field is still young and the use of this as a therapy is currently way off. But with more and more scientists daring to come to the field and grants are given in the right way, we can hope that sooner or later the works are going to be available not only on the bench but also in bedside too.